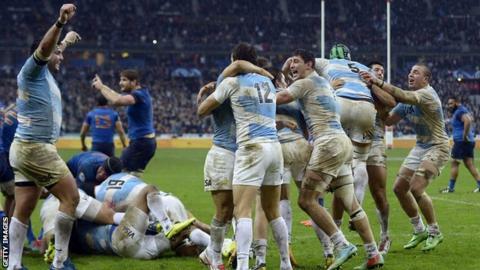 Nicolas Sanchez kicked three drop goals and two penalties as Argentina upset France with a victory in Paris. Les Bleus had beaten Fiji and Australia in their previous two Tests, but trailed 18-3 after 47 minutes. The Pumas scored four drop goals in total - with Juan Martin Hernandez kicking the second of them. Wesley Fofana scored France's only try in the second half, before Rory Kockott's penalty gave them hope of a late win, but Argentina held out. France: Scott Spedding, Yoann Huget, Maxime Mermoz, Wesley Fofana, Maxime Medard, Camille Lopez, Sebastien Tillous-Borde, Xavier Chiocci, Banjamin Kayser, Nicolas Mas, Pascal Pape, Sebastien Vahaamahina, Thierry Dusautoir, Bernard Le Roux, Damien Chouly. Replacements: Guilhem Guirado, Alexandre Menini, Uini Atonio, Yoann Maestri, Charles Ollivon, Rory Kockott, Remi Tales, Mathieu Bastareaud. Argentina: Joaquin Tuculet, Juan Imhoff, Marcelo Bosch, Juan Martin Hernandez, Manuel Montero, Nicolas Sanchez, Tomas Cubelli, Marcos Ayerza, Agustin Creevy, Nahuel Tetaz Chaparro, Guido Petti, Tomas Lavanini, Facundo Isa, Javier Desio Ortega, Leonardo Senatore. Replacements: Matias Cortese, Lucas Noguera Paz, Ramiro Herrera, Lucas Ponce, Tomas Lezana, Martin Landajo, Santiago Gonzalez Iglesias, Lucas Gonzalez Amorosino.